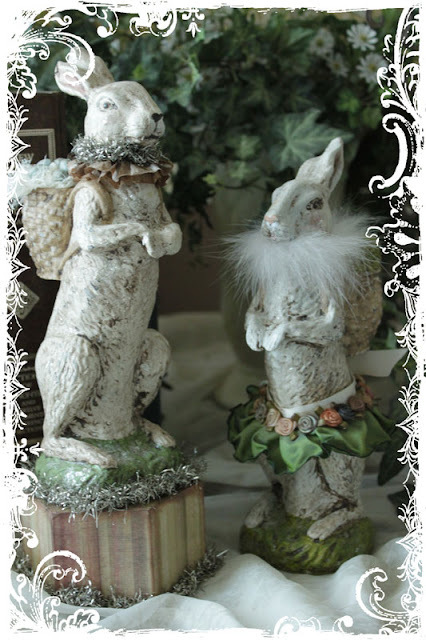 **My Desert Cottage**: Bringing out the bunnies!!! It's time to break out some of my favorite seasonal decorating things. I made these bunnies last year and I had a really hard time putting them away. I'm actually a little late getting them out this year. I wanted to do a tutorial to show you how to make them but I just haven't had the time... (I'll tell you why soon!) But I can try to describe what was involved. They are really quite easy and very fun! 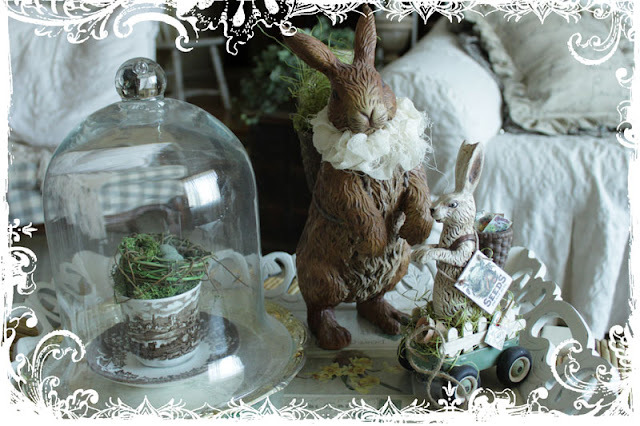 Both of these bunnies were made from those resin figures that are made to look like traditional chocolate bunnies. You can get them this time of year at JoAnne and maybe TJMaxx. I painted them and then used an umber glazing liquid to antique them. I also used a bit of sandpaper to give them some more wear and tear. The boy got a collar of brown crepe paper folded lengthwise to give a double ruffle and a piece of vintage tinsle. Then I covered a small wooded box bottom with paper and used the tinsle on that too. The basket was not hollow, so I glued some cheesecloth to the top and made some little eggs out of paper clay to go on top. The girl got much the same treatment except I made a little skirt for her out of ribbon and little ribbon roses. She got a fur trim collar and moss in her basket and a tiny bit of mica flake for shimmer. I didn't have to change the big bunny very much. I just added a rustic gauze collar around his neck. This bunny was a lot of fun. He was also one of those "chocolate" bunnies that I painted and antiqued. I made the wagon out of an old tin. (Like for sucrets, or mints) The wheels were made by inserting a small dowel into store bought (Michaels) wooden wheels and gluing them to the bottom of the tin. I use a piece of heavy paper to cover the dowl as well for extra support. The fence is made from wooden popsicle sicks (or craft sticks as they call them in the store) I printed out the vintage seed packet from my computer, added the green moss and topped the wagon off with some tiny terra cotta pots from Michaels. This bunny really just got a few paint changes and a coat of vintage mica flake. Bethany Lowe designs make some and you can usually find it at Christmas time. This chick was already yellow and crackled. I added glitter AND mica flake to him. I made the stand from a cardboard box. 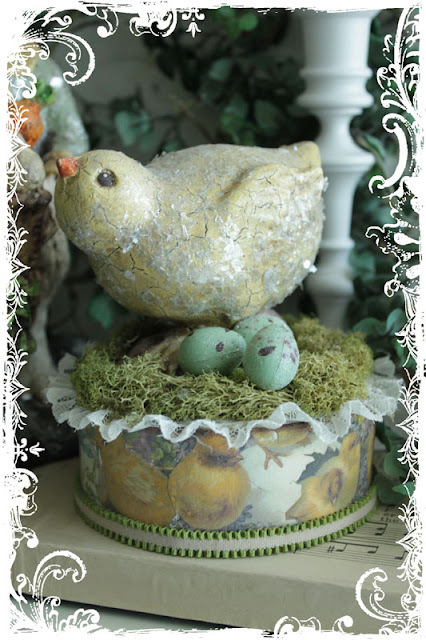 (They sell paper mache' boxes at JoAnne) I printed out some vintage Easter postcard images and used them to cover the box. A little ribbon and lace trim, some moss and more little eggs (covered in glitter of course) and we're done! That's my little Easter mini Tutorial. Hope you are inspired to go out and bring home some bunnies home for yourself. If you have any questions... email me. I'd be happy to answer them if I can. Love all your bunnies, Karen! I also love the way you fixed them up with those added embellishments and the stands you made for them. They really add something that might have just been ordinary before! It is so great how you take the store~bought and totally revamp and make them original. I have not decorated at all for Easter....shame on me! I see these bunnies at TJ Max..they are pretty reasonable. 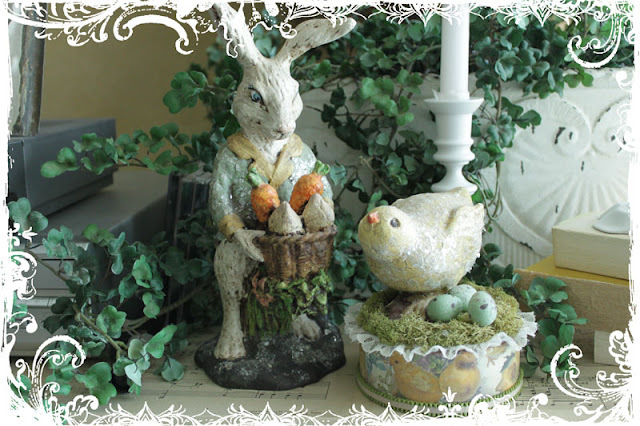 I have sooo much that I am trying to get rid of~ my Easter decor will have to come from items that I already have. Garage sale this weekend and then the Antique fair the following weekend. Hoping my garage gets cleaned out and I can concentrate on keeping things a bit more simplistic. I like your bunnies and chick, they are so beautiful!!!!!! The bunnies are really cute. Spring is a great time of year. I love that you spruced up your bunnies! They are so beautiful with your unique little touches added. Well done!!! Love your bunnies Karen - what a great idea. Thanks a for sharing. YOur bunnies are fabulous. You are so creative and thanks for sharing. Love your bunnies...and how you altered them to fit your style! Thanks for sharing the how tos. You are killing me with all this creativity!!!! I would have never thought to do all that to a bunny, and I LOVE bunnies!! Hmmmm, might have to make yet another trip to Michael's and Jo Annes-thanks for the good reason to go!! Your bunnies and the chick are adorable. You have that knack for seeing something more in the mundane. Wow...how creative you are. Your tutorial was great, thank you so much. You should put these in your shop! I wish I had time to make one this year, I have nothing very cute out for the holiday! These are so great, you did an amazing job! I love your bunnies and the way that you altered them is amazing. Funny, I just posted about bunny rabbits. Must be the season. How precious! I've seen those little chocolate bunnies in the stores and thought they were cute, but you made them even cuter! 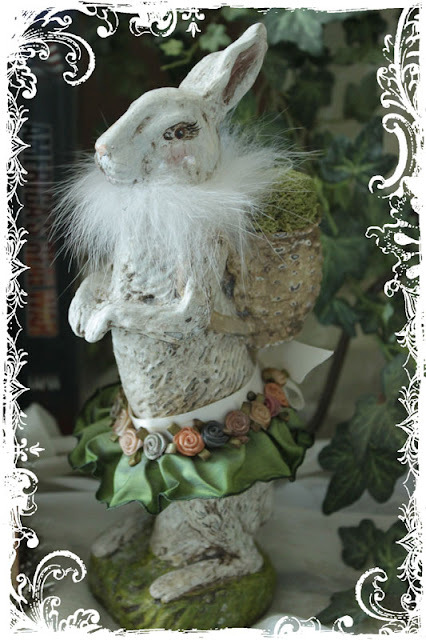 I absolutely adore the girl bunny with her feathers & skirt! wOW KAREN. How adorable all these bunnies are. Love how you fixed them up and decorated with mica flakes for a vintage feel. Just lovely. You always do the neatest things whenever I visit. great job! Well you know I love them! I love your Easter decorations. You are one step ahead of me as I haven't brought out any decorations. Have a good up and coming weekend. As well as your darling bunnies, I hope! Oh, so sweet decors, dear Karen! Oh wow, these are charming, thanks for all the ideas! I'm late in bringing out my bunnies too...your's are beautiful! Also wanted to let you know that I posted (FINALLY!) about the loot you sent me. Thank you again Karen....you really were too generous! Thank so much for visiting my blog! I am hooked already. Just need to find ways to learn new skills! I love this article. What great (and doable) ideas! Your decor and the presentation of them is just gorgeous. Love them! Stop by Flea Market Round-up this weekend! 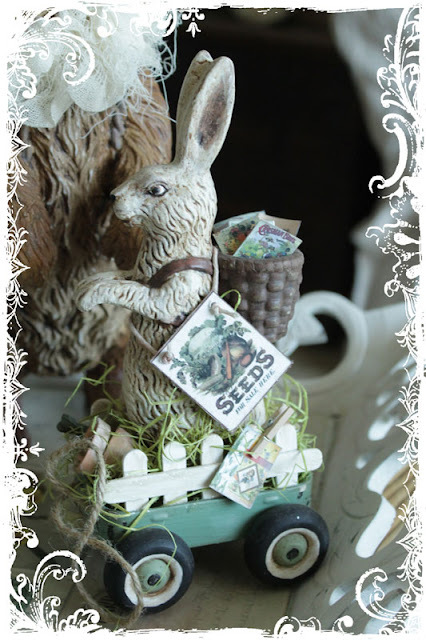 Hop on over to my blog to enter my little Easter giveaway! 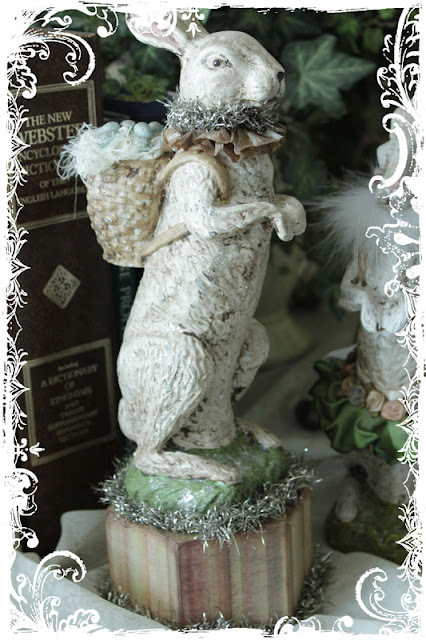 Perhaps a petite basket to go with your lovely "wabbits!" Love your bunnies Karen. How sweet of you to share the instructions on how do make them with us too. They are just adorable. How cute- love the bunny with the floral skirt- she's looks like shes going somewhere very important. Yeah, I just love this mini-tutorial. You make it sound so easy. But I am completely certain that if I attempt it, I'll end up with giant clumps of glitter bunnies with moss all over them! I'm especially enamored with your little wagon. Holy creative! I just love your bunnies. they are wonderful You are just so , so creative. Thanks for sharing . Love your sweet bunnies!! They are all so pretty! Enjoy Spring! Oh what a fabulous blog! Thank you!